A lot of the Summer was too hot and/or bright for bird photography. It was even too hot for macro work; I think the dragonflies were exhausted from the heat. I spent a lot of time playing with Photoshop and the various plug-ins. And I found a new home for my edits on Flickr. I am going to use my Instagram account for birds and nature photos; that audience is rather lukewarm about the edits. I found some groups on Flickr that do photo manipulation and edits, so it is a good solution. And you, my loyal readers get a bit of everything. Here is a series that plays off one of my favorite colors: Orange. What if Houston was the setting for ... Blade Runner? The recent Time Travel adventure had some photos of both old and new downtown Houston architecture. 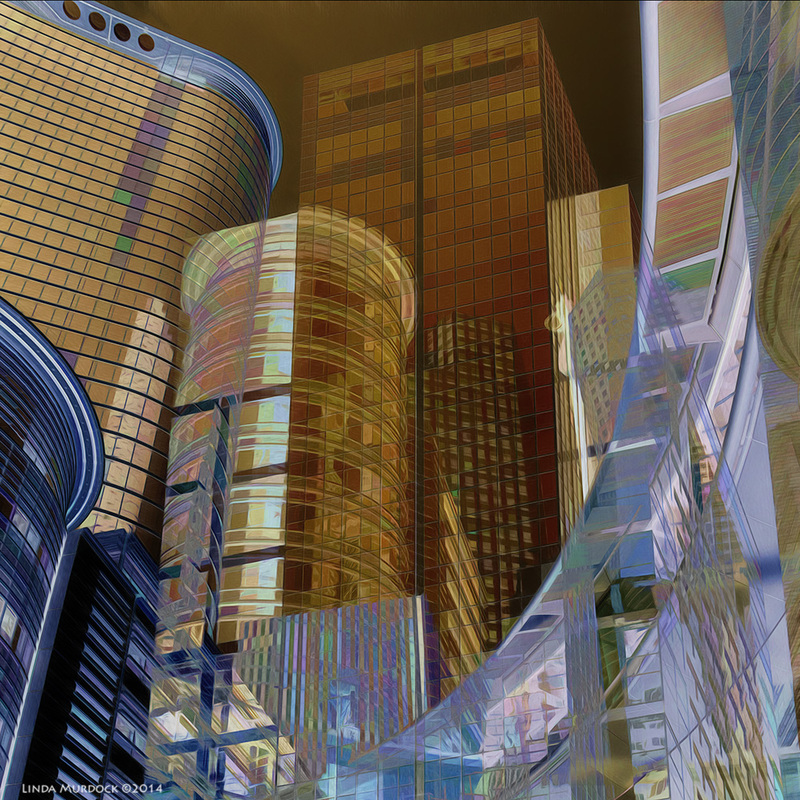 The image above is some of the newer glass buildings done in overlays and with a heavy dose of Topaz Simplify. Looks even more futuristic than the real thing, don't you think? One of those trips to the warehouse district downtown produced a Cat-in-the-Window shot with my own reflection. I combined that with an old photo of some fence posts on Bolivar Island. Doing these overlays in Photoshop is fun; you really don't have any idea how it is going to turn out. And this is some coastal vegetation, Glasswort, blended with a cracked stucco wall image. This foliage is really pretty; you can find it in green, orange and even deep red. I think the color is indicative of the salt content. I read that you can eat it in salads, but I am not that brave. A trip to the Houston Museum of Natural Science yielded some interesting textures from the Hall of Ancient Egypt. A lot of orange and tan colors; they used a toxic orange mineral pigment called realgar for tomb paintings. This is several photos blended together. Photography in the near dark of a museum is challenging. This one above is truly time traveling - a bit of Freeport and Rosenberg, two small towns in the Houston area. The way this kind of effect works is to load several photos in Photoshop as layers. Then you play around with the Blend modes until you find something interesting. You can erase parts if you like, use plug ins and filters on the individual photos or the results. It is a truly creative process. The lovely cows above were in a field on the way back from Brazos Bend. This image is two separate photos blended and then given some Nik Collection processing and a bit of Fractalius. They were in totally different parts of the field, but now they are forever in the same frame. Photoshop is a wonderful tool. Makes you wonder if what you see in adverts (and worse) in the news is real. Tank farm - not a composite, just a big crop from a set of three tanks. One of my favorite places on the industrial side of town is a factory where they manufacture iron oxide additives for paint and other uses. Everything is a fantastic rusty brown and orange. This is a tight crop from a set of three tanks and has been dressed up a bit with Fractalius. I didn't set out to do so many orange pieces, it just worked out that way. Maybe it is Fall sneaking up on us? Are you ready for a change in weather? Let me know what you think about the PhotoArt in the comments. And remember, Internet Explorer probably won't work for commenting. Chrome works fine, and perhaps some other browsers. I turned in a ticket to SquareSpace and their Engineers are going to hop right on it.